I'm so behind with my halloween content this year! I did hope that my first halloween look would be live on the 1st October but I've had an eczema flareup and I'm being weighed down (almost literally) by all of the christmas products I have for my gift guides! 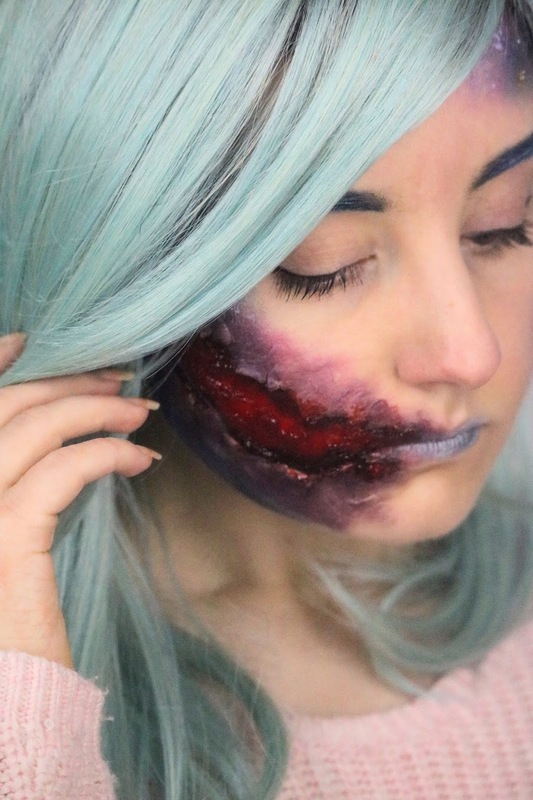 It seems that sadly christmas is taking precedence over halloween this year but today's post is finally my first halloween look of the year and you'll be glad to know that it is incredibly quick and easy! 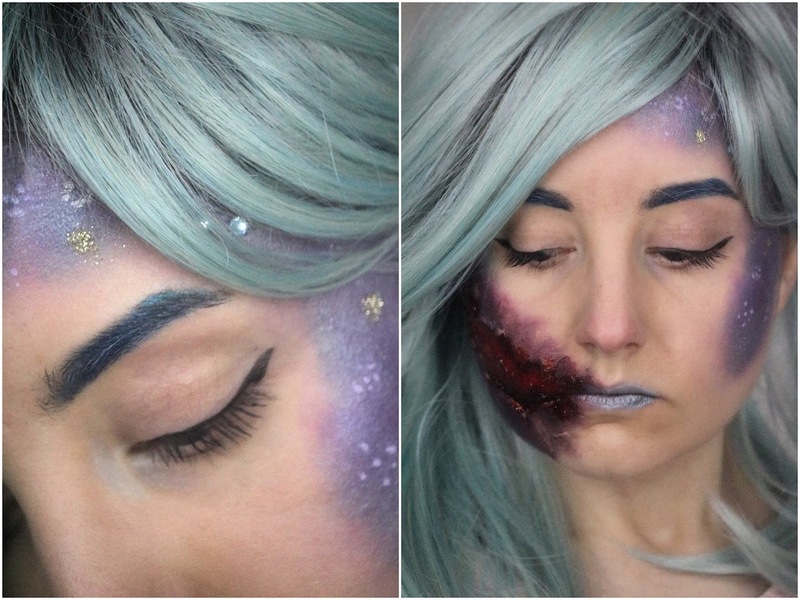 I love halloween so I've already posted a fair few halloween looks on my blog already but for my first of 2018, I wanted to do something very simple, quick and easy but still fairly dramatic. 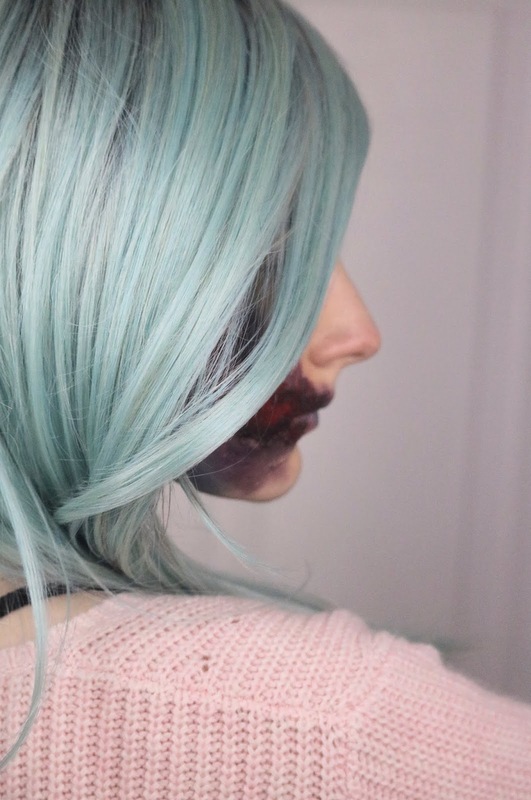 You will need one or two specifically halloween or SFX makeup products such as a gorgeous wig and the Ben Nye nose and scar wax as well as fake blood; however, you probably already own the other products or they can be bought very cheaply. I think there are two striking aspects of this very easy look and the first is the gorgeous turquoise blue wig from Hot Hair. I'm not a very good wig styler or wig wearer...so don't judge me too harshly but I love this one. I have tried a couple of halloween wigs in the past and they've been very cheap so naturally they were all very itchy, uncomfortable and quite thin but this one is much thicker, it's more comfortable and it isn't itchy, thankfully! My look is a mixture between a simple mermaid inspired makeup look with glitter and a gory caught mermaid with a slash across her face were she's been hooked...it's definitely not the most original but I like combination of pretty glitter and fake blood! The shade of the wig is perfect for any kind of mermaid or fairy look this halloween. It's a great size and length which with a wig cap is fairly easy to put on although I did struggle a little with the styling of it especially as I was trying to not get fake blood in it *obviously I ended up with fake blood all on one side*. Hopefully my skin will turn to normal soon and I'll be able to create more halloween looks soon with this wig. If you're looking for a halloween wig or a new autumn style then definitely check out Hot Hair as they have an amazing range to choose from, some of which are currently 20% off including this one! I started with my regular makeup routine with the amazing Dear Klairs Illuminating BB Cream from Koja Beauty followed by the NYX contour in Taupe and the Essence Fixing Powder. For the Next onto the brows and I filled them in with a dark blue shadow and added a light blue on top then my trusty Tweezerman brow gel. For the face all I did was take a selection of pretty blues and purples to create areas of multicoloured and shimmery skin with a little of the Makeup Revolution Skin Kiss highlighter in Dream Kiss over the top for extra shine! I added glitter, gems and dots to those areas but in an ideal world I definitely would have used some fishnet tights stretched over the skin to create a mermaid and scaly texture as I have done previously but I couldn't find any - it would have make the look so much better! Now for the fun and messy part! I love using the Ben Nye nose and scar wax as it creates the most interesting textures to the skin like torn, mottled and scarred skin so it's great for halloween looks. You should use spirit gum with it beforehand so it sticks well but I use a combination of the tackiness of the wax and lash glue to DIY a solution - just buy spirit gum though. I started by using the back of my tweezers to push and mould the wax to the skin where I wanted it and carried on until I got the shape that I wanted then aded lots of glue to help it stick more securely but I personally like the torn look the wax gives as it makes the look more 3D and textured. 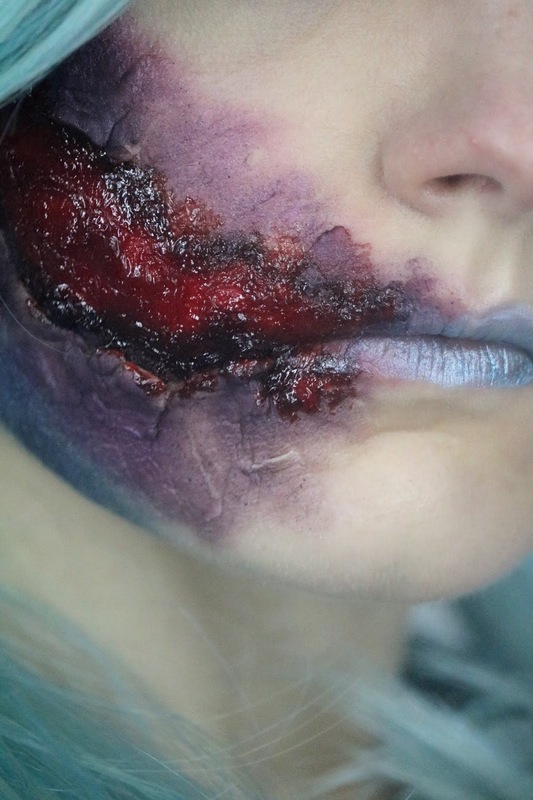 I filled in the wound with red lipstick, black eyeshadows and fake blood then blended reds and purples around the outside of the wound to give a bruised appearance. It was a very quick and easy look to create but if I recreated it I'd definitely use fishnet tights for the scales, I'd add more to the eyes and use more fake blood, it is halloween after all. I hope you liked this quick and easy halloween look - hopefully there will be many more, if my skin behaves (fingers crossed everyone). What do you think of this quick and easy look? Do you celebrate halloween? That is such an amazing makeup look! Ooh this looks amazing!! So creative and realistic! Ahh love this idea! I always want to do halloween looks but can never be bothered with the clean up hahaha! Omg you are so talented! This looks amazing! You are so talented. This is incredible!!! Love the contract between the pretty metallics and the gore. Such a fab halloween makeup look. This is amazing! I love the wig. you make this look so effortless! It came out amazing!!! This looks stunning! And the wound looks so real!